The Church consists of all saved people from the Day of Pentecost after Jesus’ return to heaven until His return to receive her to Himself (Acts 2; 1 Thess. 4:13-17). Historically, Israel has consisted of the descendents of Jacob. In the future, the prophetic, true Israel will consist of the elect remnant of these descendants, who will be saved at Jesus’ second coming to earth (Rom. 9; Deut. 30:1-10; Ezek. 36:16-38). The Church is related to God by the new birth (John 1:12-13), based on the new covenant that Jesus mediated by His atoning death (Heb. 8:6; 12:24; 1 Cor. 11:25). Israel was related to God by the Mosaic covenant (Exod. 19:5), which they broke (Jer. 31:32) by their idolatry (Jer. 3; Hos. 2:1-5; 4:12-13). The elect remnant of Israel will be restored to God, as promised by the new covenant (Jer. 31:31-40; Ezek. 36:21-38). Being espoused to Jesus (2 Cor. 11:2), all who compose the Church corporately constitute His bride (Eph. 5:23-32). That of the Church is Jesus and His universal wealth (Eph. 1:3, 11; Rom. 8:17; Heb. 1:2). That of Israel is the land God promised to Abraham, Isaac, and Jacob (Gen. 15:18; 35:12; Deut. 30:5; Jer. 16:14-15) and its rejuvenation (Isa. 35). The Church could not have existed in OT times because of the time and nature of her formation. Her formation did not begin until after Jesus’ return to heaven (Matt. 16:18; Acts 1:5; 2; 11:15). She is being formed by the Holy Spirit’s baptism, a Church Age work (Acts 1:5; 1 Cor. 12:13, 27; Eph. 1:22-23) and is built upon the teachings of the Lord’s apostles and the NT prophets, now recorded in the New Testament, with Jesus as her chief cornerstone (Eph. 2:20). Israel was a nation from their departure out of Egypt and their receiving the Mosaic Law, c. 1491 B.C. (Exod. 19:1-6) until their final dispersion by the Romans in A.D. 70. She was revived as a nation on May 14, 1948. The divinely elected remnant of her people will be saved at Jesus’ second coming to earth and will continue forever (Jer. 31:36; Amos 9:11-15; Ezek. 37:19-28). See Romans 11:1-6, 11-12, 15-17, 26-27, 30-31 (Note that “All Israel” v. 26, is a synecdoche – a figure of association – for the elect remnant of Israel). The Church is presently a part of our Lord’s nonpolitical, spiritual kingdom (Col. 1:13). As His wife, she will also have a nonnational place in His earthly, millennial kingdom, with Church members and other saved people ruling with Him (Rev. 2:26-27). Israel will be the foremost nation in or Lord’s earthly, millennial kingdom (Ps. 47; Isa. 55:5; chap. 60; Zech 8:23; Mal. 3:12). Jerusalem will be the capital of Jesus’ world government (Isa. 24:23; Zech. 14:16-17; Matt. 5:35). *Floyd H. Barackman (March 20, 1923- September 11, 2007) was Instructor of Systematic Theology at Practical Bible Training School (Now Davis College), Bible School Park, New York, where he taught for twenty-five years. He pastored Calvary Baptist Church in Meadville, Pennsylvania, Grace Baptist Church of Maine, New York. He is the author of numerous Bible study materials as well as How to Interpret the Bible and his very helpful work on Biblical Doctrine entitled Practical Christian Theology (PCT) published in Grand Rapids by Kregel, 2001. 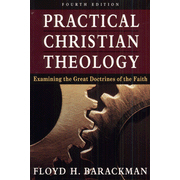 PCT is complete, concise, and nontechnical, Barackman’s handy one-volume text explores the great doctrines of our faith, including the Bible, God the Father, the Lord Jesus Christ, God the Holy Spirit, angels, man, sin, and salvation. Easy-to-follow outlines for each chapter organize the material for systematic study. Charts, notes, and subject indexes make this a great reference tool. The article above is adapted from PCT “Appendix Q”, 524-525.